50 years of Toyota in the U.S.
On October 31, 1957, Toyota officially opened for business in the United States. The American auto business hasn't been the same since. When Toyota entered the American car market with the Toyopet in 1957 (all years in this story are calendar years, not model years), General Motors was at its zenith, not just as a business but as an American cultural institution. Toyota, on the other hand, was nothing, at least as far as General Motors, Ford and Chrysler were concerned. European imports - sporty cars and the strange but popular Volkswagen Beetle - were causing some stir and forcing Detroit to respond with cars like the Chevrolet Corvette and Corvair and the Ford Mustang. Cars from Japan, a nation synonymous with exporting cheap toys, hardly seemed a threat. Some on the American side of Toyota's new venture were worried that shoppers might not take a car called the Toyopet very seriously. But Americans were embracing a car called the Beetle, weren't they? 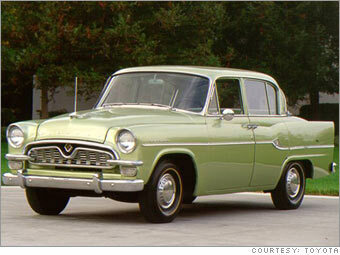 But even Toyota soon recognized that the Toyopet really didn't warrant being taken seriously, whatever it was called. It was underpowered, uncomfortable, lacking in even basic amenities, and it cost more than better offerings from European competitors.